As described in my beef heart recipe I have decided that the dogs should share their food with me. The majority of the food I buy them is for human consumption, so why not. Quail is a source of protein variety for my dogs. I don't feed it to them all that often, as they are small, bony, and pricey. But if my dogs can eat this delicacy, then why can't I? Quail. Count on at least two quail per person, as they are quite small. The quail I purchase are in packs of six. Fresh (or dried) rosemary, to taste. Preheat oven to 500 degrees and line the bottom of a roasting pan with aluminum foil. Melt the butter in a bowl. Mix with rosemary, salt, and pepper. Individually toss each quail in the butter mixture. 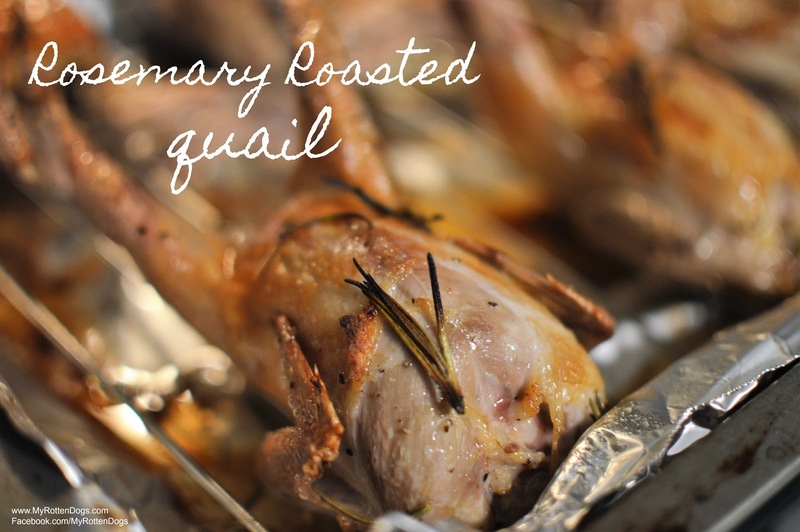 Place the quail, breast up, on the roasting pan. Tossing the quail in butter imparts a little moisture in these lean birds, and makes the skin a nice, crisp brown. They have their own flavor, and the rosemary, salt and pepper compliment it. Being small, they cook quickly and can handle the high heat well. These are fun to eat. My dinner companion called them "Barbie chickens." I laughed, because it almost felt like we were eating toy food. This was a tasty, quick, easy meal, and pairs well with just about any side dish. Big thanks to my dogs for sharing their food with me, yet again. We have never had quail, Mom hasn't either. Your recipe sure sounds good to us. It makes life easier to just buy food that's the same for everyone! That looks really good! This looks delicious! The pups (& I!) have yet to try quail. I saw that Raw Feeding Miami sells quail, but only stuffed with green tripe. Where do you get your quail? At meijer, and an Asian market.